Eye On Sports Media: Ole Miss legend Harry Harrison joins CSTV's Greg Amsinger and David Pollack for, "Chick-Fil-A SEC Tailgate"
Ole Miss legend Harry Harrison joins CSTV's Greg Amsinger and David Pollack for, "Chick-Fil-A SEC Tailgate"
Legendary University of Mississippi safety Harry Harrison joins CSTV's Greg Amsinger and former SEC Player of the Year David Pollack (Georgia) as a guest analyst on CSTV's weekly live show, "Chick-Fil-A SEC Tailgate," on Saturday, Nov. 17 (11 a.m.–noon, ET). The show this week originates live from Oxford, Miss. outside of Vaught-Hemingway Stadium at the Grove Stage, where the *No. 1-ranked LSU Tigers take on the Ole Miss Rebels. Harrison was an All-American safety at Ole Miss, recording 181 tackles and 16 interceptions during his career. The one-hour show is broadcast live every week from the site of CBS Sports' SEC Game of the Week as Amsinger and Pollack are joined by a former star player from the home team. 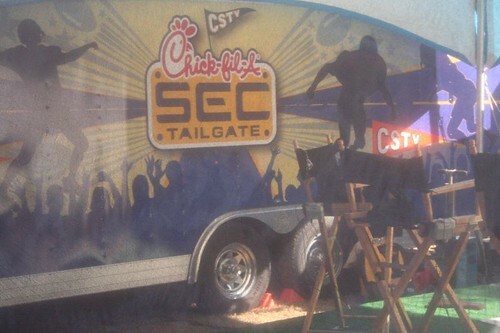 Fans are invited to visit the "Chick-Fil-A SEC Tailgate."